Our Spoons Came from Woolworths sounds really interesting- I’d love to win it hehe! I would like to win Naked Lunch! Thanks for the giveaway! I’d like to win Spoons please! Love your blog name and header…I am one of the participating blogs and wanted to stop by to say hello and enter the contest. I would love to win Our Spoons Came From Woolworths. Thanks for the giveaway! I would be thrilled to win either book! Thanks for a great giveaway! May I request to enter for Naked Lunch? I’d like to be counted for Naked Lunch please. They both sound great – I wouldn’t mind winning either! I would love to win ‘Our spoons came from Woolworths’ – heard a lot about this book. Thank you. Either one would be great! Thanks! Thank you for the giveaway and for being prepared to ship worldwide. I read The Naked Lunch many years ago and found it fascinating as I recall. So I am torn about which book to select but as I have never heard of Our Spoons Came from Woolworths, I would select that as my choice. I’ve heard so much about Comyns and have Who Was Changed and Who Was Dead on my TBR, but I’m eager to read more. Please put my name down for Our Spoons Came from Woolworths. I would love to read either thank you, but ‘Our Spoons Came From Woolworths’ would be my first choice. Cheers!! Argh! Free books! This has just made this awful hangover I’m suffering lessen a little. I would very much like to win ‘Naked Lunch’ – if it’s a modern classic then I HAVE to read it to fulfil my reading Classics resolution! But quite honestly, any free book is a book I want. I think Naked Lunch would be my choice here. Naked Lunch has been on my ‘must read one day’ list forever. I’d love to read it! Naked Lunch would be my choice. Thanks for offering the books. I’ve love to be entered for Our Spoons Came from Woolworths. I’d pick Our Spoons Came From Woolworths! I’d like to be entered for “Our Spoons Came From Woolworths”, since I have wanted to read Barbara Comyns for ages! Please enter me in the Spoons hat please. 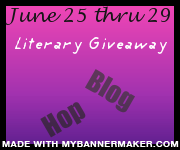 My mother has been sick and I never got around to signing up to participate in the Literary Giveaway Blog Hop. But I’ve started a monthly giveaway on my blog and I’ve got a June Giveaway going on this month at my blog, and I’d love to invite you to stop by and throw your name in the hat for Anna and the French Kiss! It’s a US giveaway only this month, but next month, I’ll be offering an international giveaway for a $25 Amazon card! If you follow me, let me know. I always follow back! I’d love to win Our Spoons Came From Woolsworth! I’m dying to get my hands on a copy of ‘Naked Lunch’ – I’ve just discovered the Beat generation and I’m on a bit of a roll! Thank you, what a great prize! Thanks for the giveaway! I’d love to win Naked Lunch. I’m on the blog hop tour as well, and hope you have a chance to stop by, and will enter my giveaway. I would love to win Our Spoons Came From Woolworths. Thank you for the chance to win! These both sound great. I’d be happy with either. Thanks! I would like to win Naked Lunch. Thanks! I’d like to read Naked Lunch, I think. I didn’t realize that Mexico worked its way in there, and I’m fascinated by anything concerning American writers in Mexico. Thanks! I would love to win either! Thanks for the chance to win! I’ dlike to win Naked Lunch. I have that on my tbr list forever. Thanks for hosting this. Thanks for the giveaway! I’d love to win Our Spoons Came From Woolworths. I’d be happy with either book! Jumping up and down for Spoons Please! I would love to win either one – I can’t pick!! I’d love to win Naked Lunch! I’d love to read Our Spoons Came From Woolworths! I think I’d like to be entered to win Spoons. Thanks!! Naked Lunch would be my choice. Thanks for the giveaway. I would like to win Naked Lunch. Great book selection. Thanks for offering the giveaway. I found your blog through the blog hop giveaway. I am currently following you through RSS, and I’m also participating in the blog hop. I’d like to read Our Spoons Came from Woolworths, by Barbara Comyns. Thanks for the giveaway! Our Spoons Came from Woolworth’s sounds really good – I’d love to win it – thanks for the chance! Either of the books would be great for me. Thanks! Naked Lunch is one that I read when I was younger (kind of ho-hum for me then), then re-read when I was older (I liked it a lot more). Our Spoons Came from Woolworth’s seems as though it would be a great emotional read – how the choices we make in haste affect the rest of our lives. Thanks for the chance to win! Our Spoons Came from Woolworths sounds fascinating! Thanks so much for sharing the news on the giveaway – it’s a lot of fun! I’d love to win “Our Spoons Came From Woolworths” by Barbara Comyns. I would be thrilled to win “Our Spoons Came from Woolworths” It sounds great. Thanks for the chance. Oour Spoons Come from Woolworths sounds really nice, please enter me for that. Thanks for the giveaway, nice choice of books! I would love to win Naked Lunch. My email address is cerievans1 at gmail dot com. Thanks. I would prefer Our Spoons Came From Woolworths. I understand that kind of poverty. I lived it. I’d love either but my first pick would be Our Spoons Came From Woolworths by Barbara Comyns! thank you for the giveaway!! I would love to win Our Spoons Came From Woolworths. I love the title of Our Spoons Came from Woolworths, so I would like to win that one. Naked Lunch – I have at least two friends who will no longer respect me if I don’t read this by the end of the year! Oh, I’d love to read Naked Lunch! I’d love to win Naked Lunch by William S Burroughs! Thanks! Our Spoons came from Woolworths sounds really good and i would love to read it! I’d love to win either book! Great giveaway. I’ve read The Naked Lunch but have had my eye on Our Spoons Came from Woolworths (my favourite shop as a child) for ages. Our spoon came from woolworth’s sounds great, and I’ve never heard of it before! Hiiiii! Thank you so so much for the giveaway! I would love to win Our Spoons Came From Woolworths by Barbara Comyns!! Thanks for the giveaway! I would love to win a copy of Naked Lunch by William S Burroughs. I would love an opportunity to win Naked Lunch by Burroughs. I would like Our Spoons Came From Woolworths by Barbara Comyns. I would like your copy of Naked Lunch if I win your giveaway. It’s a book I’ve read about but have never read and though I’ve always wanted to! Both sound very interesting. Thanks for hosting this giveaway! Our Spoons Came from Woolworths would be my first pick. Thanks for the opportunity. I’d love to win Our Spoons Came From Woolworths. I would love to win Our Spoons Came From Woolworths. Thanks! I’d love to read Our Spoons Came From Woolworths. Thanks!